Inject natural vibrancy into any space with the incorporation of the botanical interiors trend. The botanicals trend offers a way for us to stay in touch with the natural world amidst the rush of fast-paced modern lifestyle. The trend blurs the borders between interior and exterior space, making for a new way of thinking about what we view as interior design. It’s this thinking that inspired the recent Airbnb and Pantone revamp a London apartment that brings the outdoors inside. Dubbed the “Outdoors In” home, it is meant to offer fans of the new Pantone colour an opportunity to thoroughly immerse themselves in it and “revive, restore, and renew” in the process. Opt for natural settings such as Hot Coffee prints on raw linen by Harem that you can place on a bed or couch as a throw, as a wall hanging or scatter cushion. Alternatively, add some botanical pattern to your floor with the outdoor Zores tropical rug. The botanical trend serves as an umbrella under which the tropical, floral and leafy looks reside. Bold banana leaf wallpaper, floral textile reminiscent of chinoiserie (defined as 18th Century European interpretation and imitation of Chinese and East Asian artistic styling), as well as scientific prints of herbaceous leaves, all fall under this theme. This means that there is a wide and wonderful choice for all preferences and styles. For a softer, more elegant finish, create a feature wall using the floral Chinoiserie wallpaper. 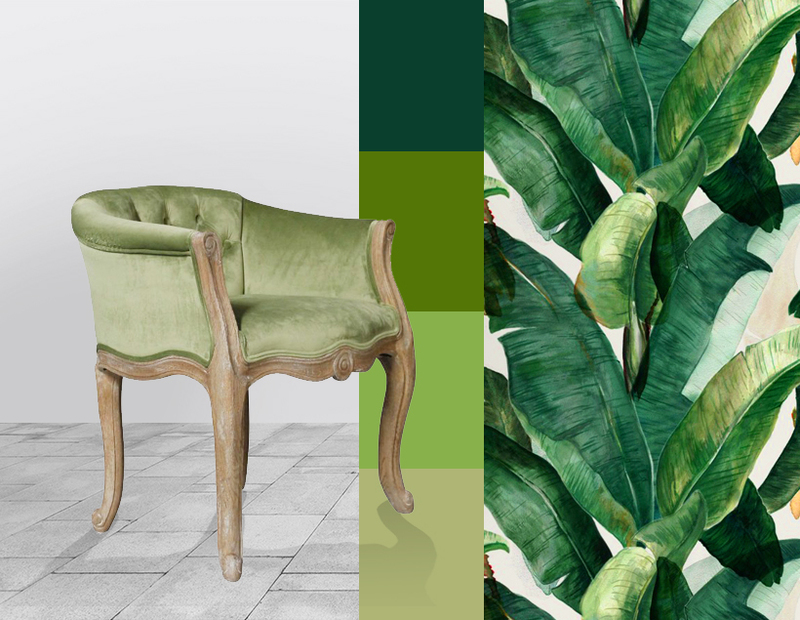 Shades of green on the wall or furniture pieces like this Stella stool in a peridot green are a good way to bring this lush trend into a setting without opting for print. Add a few actual plants for a greenhouse feel. Decent vases, pots and planters are essential to this look. Consider the colour, material and texture of these elements to suit the space. Natural materials go well with this trend, be it rough hewn marble, wood where the grain is showing, or rattan and hessian weave detail. A few opulent textures such as gold or marble finish the look off well, giving the feeling of luxury. If you're more likely to end up with brown, crispy versions of former thriving organisms, opting for well-crafted imitations may be a more practical solution. Moreover, you can console yourself in the water conscious, evergreen effect of faux plants and flowers while achieving the same natural look. Whatever your preference, a touch of the botanical will create variation and depth, bringing your interiors to life for a tranquil result.